Amazon.com description: Product Description: An eminent paleontologist with the soul and skill of a poet, Loren Eiseley (1907â1977) was among the twentieth centuryâs greatest inheritors of the literaryÂ tradition of Henry David Thoreau, Charles Darwin, and John Muir, and a precursor to such later writers as Stephen Jay Gould, Richard Dawkins, and Carl Sagan. 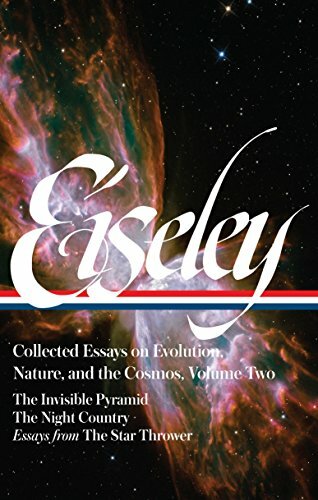 After decades of fieldwork and discovery as a âbone-hunterâ and professor, Eiseley turned late in life to the personal essay, and beginning with the surprise million-copy sellerÂ The Immense JourneyÂ (1957) he produced an astonishing succession of books that won acclaim both as science and as art.Â Now for the first time, the Library of America presents his landmark essay collections in a definitive two-volume set. This second volume begins with The Invisible Pyramid (1970), a book of meditations on the origins and possible futures of humankind set against the backdrop of the Apollo 11 landings. As Western civilization attains new heights of scientific awareness and technological skill, is it also blind to its own limits, doomed to destroy itself like the lost civilizations of the ancients or other âspore-bearersâ in our evolutionary past? Eiseley makes an urgent, environmentalist plea in these essays: we must protect the planet from which we emerged against our unchecked power to overpopulate and pollute and consume it. A companion volume gathers The Immense Journey (1957), The Firmament of Time (1960), The Unexpected Universe (1969), and a selection of Eiseleyâs uncollected prose.